4.5.1 What is competency-based learning? Competency-based learning begins by identifying specific competencies or skills, and enables learners to develop mastery of each competency or skill at their own pace, usually working with a mentor. Learners can develop just the competencies or skills they feel they need (for which increasingly they may receive a ‘badge’ or some form of validated recognition), or can combine a whole set of competencies into a full qualification, such as a certificate, diploma or increasingly a full degree. Learners work individually, usually online, rather than in cohorts. If learners can demonstrate that they already have mastery of a particular competency or skill, through a test or some form of prior learning assessment, they may be allowed to move to the next level of competency without having to repeat a prescribed course of study for the prior competency. Competency-based learning attempts to break away from the regularly scheduled classroom model, where students study the same subject matter at the same speed in a cohort of fellow students. The value of competency-based learning for developing practical or vocational skills or competencies is more obvious, but increasingly competency-based learning is being used for education requiring more abstract or academic skills development, sometimes combined with other cohort-based courses or programs. 4.5.2 Who uses competency-based learning? The Western Governors University in the USA, with nearly 40,000 students, has pioneered competency-based learning, but, with the more recent support of the Federal Department of Education, competency-based learning is expanding rapidly in the USA. Other institutions making extensive use of competency-based learning are Southern New Hampshire University through its College for America, designed specifically for working adults and their employers, Northern Arizona University, and Capella University. Competency-based learning is particularly appropriate for adult learners with life experience who may have developed competencies or skills without formal education or training, for those who started school or college and dropped out and wish to return to formal study, but want their earlier learning to be recognized, or for those learners wanting to develop specific skills but not wanting a full program of studies. Competency-based learning can be delivered through a campus program, but it is increasingly delivered fully online, because many students taking such programs are already working or seeking work. There are various approaches, but the Western Governors’ model illustrates many of the key steps. A feature of most competency-based programs is a partnership between employers and educators in identifying the competencies required, at least at a high level. Some of the skills outlined in Chapter 1, such as problem-solving or critical thinking, may be considered high-level, but competency-based learning tries to break down abstract or vague goals into specific, measurable competencies. For instance, at Western Governors University (WGU), for each degree, a high-level set of competencies is defined by the University Council, and then a working team of contracted subject matter experts takes the ten or so high level competencies for a particular qualification and breaks them down into about 30 more specific competencies, around which are built online courses to develop mastery of each competency. Competencies are based upon what graduates are supposed to know in the workplace and as professionals in a chosen career. Assessments are designed specifically to assess the mastery of each competency; thus students receive either a pass/no pass following assessment. 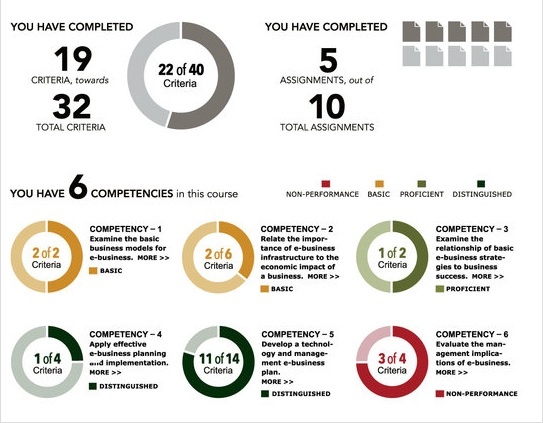 A degree is awarded when all 30 specified competencies are successfully achieved. Defining competencies that meet the needs of students and employers in ways that are progressive (in that one competency builds on earlier competencies and leads to more advanced competencies) and coherent (in that the sum of all the competencies produces a graduate with all the knowledge and skills required within a business or profession) is perhaps the most important and most difficult part of competency-based learning. At WGU, courses are created by in-house subject matter experts selecting existing online curriculum from third parties and/or resources such as e-textbooks through contracts with publishers. Increasingly open educational resources are used. WGU does not use a learning management system but a specially designed portal for each course. E-textbooks are offered to students without extra cost to the student, through contracts between WGU and the publishers. Courses are pre-determined for the student with no electives. Students are admitted on a monthly basis and work their way through each competency at their own pace. Students who already possess competencies may accelerate through their program in two ways: transferring in credits from a previous associate degree in appropriate areas (e.g. general education, writing); or by taking exams when they feel they are ready. Again this varies from institution to institution. WGU currently employs approximately 750 faculty who act as mentors. There are two kinds of mentors: ‘student’ mentors and ‘course’ mentors. Student mentors, who have qualifications within the subject domain, usually at a masters level, are in at least bi-weekly telephone contact with their students, depending on the needs of the student in working through their courses, and are the main contact for students. A student mentor is responsible for roughly 85 students. Students start with a mentor from their first day and stay with their mentor until graduation. Student mentors assist students in determining and maintaining an appropriate pace of study and step in with help when students are struggling. Course mentors are more highly qualified, usually with a doctorate, and provide extra support for students when needed. Course mentors will be available to between 200-400 students at a time, depending on the subject requirement. Students may contact either student or course mentors at any time (unlimited access) and mentors are expected to deal with student calls within one business day. Mentors are full-time but work flexible hours, usually from home. Mentors are reasonably well paid, and receive extensive training in mentoring. WGU uses written papers, portfolios, projects, observed student performance and computer-marked assignments as appropriate, with detailed rubrics. Assessments are submitted online and if they require human evaluation, qualified graders (subject matter experts trained by WGU in assessment) are randomly assigned to mark work on a pass/fail basis. If students fail, the graders provide feedback on the areas where competency was not demonstrated. Students may resubmit if necessary. Students will take both formative (pre-assessment) and summative (proctored) exams. 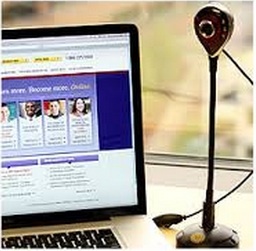 WGU is increasingly using online proctoring, enabling students to take an exam at home under video supervision, using facial recognition technology to ensure that the registered student is taking the exam. In areas such as teaching and health, student performance or practice is assessed in situ by professionals (teachers, nurses). competency-based education is being recognized as eligible for Federal loans and student aid in the USA. Consequently, institutions such as WGU, the University of Southern New Hampshire, and Northern Arizona University, using a competency-based approach, at least as part of their operations, have seen annual enrolment growth in the range of 30-40 per cent per annum. it will not fit the preferred learning styles of many students. Competency-based learning is a relatively new approach to learning design which is proving increasingly popular with employers and suits certain kinds of learners such as adults seeking to re-skill or searching for mid-level jobs requiring relatively easily identifiable skills. It does not suit though all kinds of learners and may be limited in developing the higher level, more abstract knowledge and skills requiring creativity, high-level problem-solving and decision-making and critical thinking. Activity 4.5 Thinking about competency-based education? 1. What factors are likely to influence you to adopt a competency-based approach to teaching? Could you describe a scenario where you could use this approach effectively? 2. What are the advantages and disadvantages of students studying individually, rather than in a cohort? What skills are they likely to miss out on through individual study? 3. Is competency-based learning something an individual instructor should contemplate? What institutional support would be necessary to make this approach work? 4.5 Competency-based learning by Anthony William (Tony) Bates is licensed under a Creative Commons Attribution-NonCommercial 4.0 International License, except where otherwise noted.